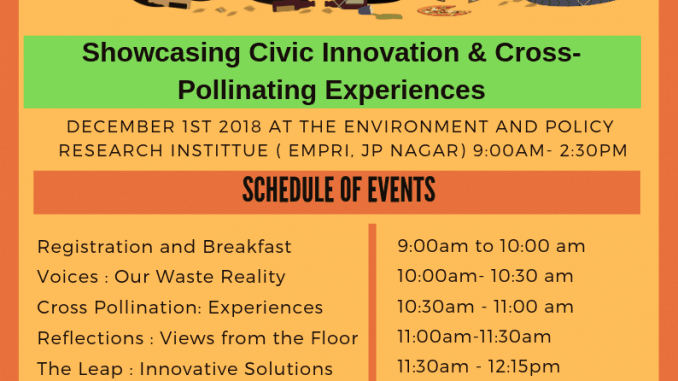 Bengaluru division of Social Venture Partnerships is organising a focused one-day event to leverage the learnings of some civic innovators, RWA’s, associations, federations, large campuses and other stakeholders in the field of waste management. Experts in the space of SWM and resource support will also participate. Titled ‘Wastex’, this event will showcase civic innovations and cross-pollinate learnings and experiences from multiple stakeholders. The event is to be held at The Environment Management and Policy Research Institute, EMPRI at JP Nagar on December 1st from 9 am to 2:30 pm. Focused on civic innovation, Wastex aims to bring together the best civic innovators and showcase their work along with solutions from the community in a half a day format that will act as a platform for all stakeholders. Participating civic innovators will have the opportunity to present their work via a stall and a select few will speak about their work. RWA’s and BAF (one participant from each) will showcase a solution as well as a large campus. SVP Bangalore’s Civic Circle works actively both in a funding and capacity level with nonprofit organizations working in the solid waste management space. Grant ranging from 3 to 20 lakhs have been made to several organizations. a. www.svpwastex.org – a platform to discover and showcase the best civic innovation (due diligence metric is defined on the website). The list of solutions will be up soon. SVP hopes this platform will be one where all stakeholders can discover solutions. b. Meaningful context setting: At the event, SVP has purposely moved away from the conventional methods of introduction to the subject. c. Closed discussion group: for all participants, where they can continue to engage on solutions. Note: This is a press note shared by Social Venture Partnership (SVP), and shared here with minimal editing.